Stand Apart on the crowded show floor with a modern DesignLine modular display. From the sign hanging overhead that can be seen across the show floor to the open floor plan, visitors will be drawn into your space. 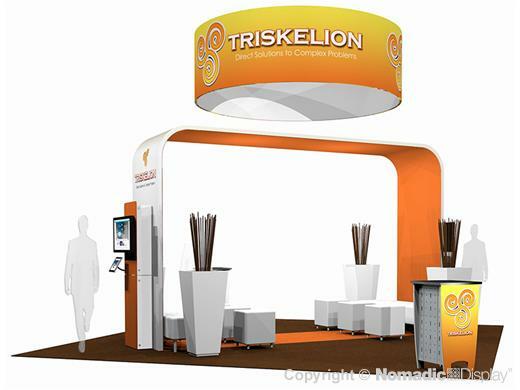 This trade show exhibit features two reception counters with lockable storage, a wide archway under which there are two casual seating areas for client conversation. iPad controlled monitors mounted to the outside of the arch offer media to attract the attention of passersby. All this for a Show Smart price.